Okay, so you’ve had enough time to process all the information on Seller Central. Let’s move on to Vendor Central and focus on first-party sellers. Yes, first-party sellers. If you remember from my last post, there’s third-party sellers (regular people who want to take a crack at selling products) and first-party sellers (manufacturers and developers). Third-party sellers use Seller Central to optimize their ad campaigns. So you can probably guess Vendor Central’s purpose. That’s right! Vendor Central is where first-party sellers optimize their ad campaigns. Check out the registration page to become a seller on Vendor Central. As you can see, Amazon becomes the full-time distributor of your products. Welcome to the big leagues. As a first-party seller, you’re selling items in bulk to Amazon and Amazon sells those products under its own brand. If “Ships from and sold by Amazon” is in the product description the product is provided by Vendor Central. Amazon puts standard pricing terms on first-party sellers, which makes your individual sales less profitable. You will be able to sell larger amounts of products. From Vendor Central, distributors can set up Sponsored Product, Headline Search and Product Display Ads. Here is the interface first-party sellers experience when choosing an ad campaign type. With Vendor Central, comes great power. Being a vendor, you have access to Amazon Marketing Services (AMS), which essentially provides more support when building an ad campaign than you would find being on Seller Central. Find out more about the features of AMS here. Amazon Marketing Services has your back, The Badger has your back. The possibilities are endless. I’m going to compare Seller Central and Vendor Central ads to badgers. In my last post, I mentioned first-party sellers and third-party seller’s differences are like that of the European and American Badger. Each has common ground, but are separated by geography and have different badger traits. Sellers that choose to advertise on Seller or Vendor Central operate in different parts of Amazon, thus producing different results for the same breed of ads. To recap, here is a diagram of the types of ads you would see from a simple Amazon search. Headline Search Ads live at the top and Sponsored Product Ads live below as well as to the right. Take Sponsored Product Ads for example, you learned about Sponsored Ads from my last post, but in Vendor Central, they appear in a different place in the search results. 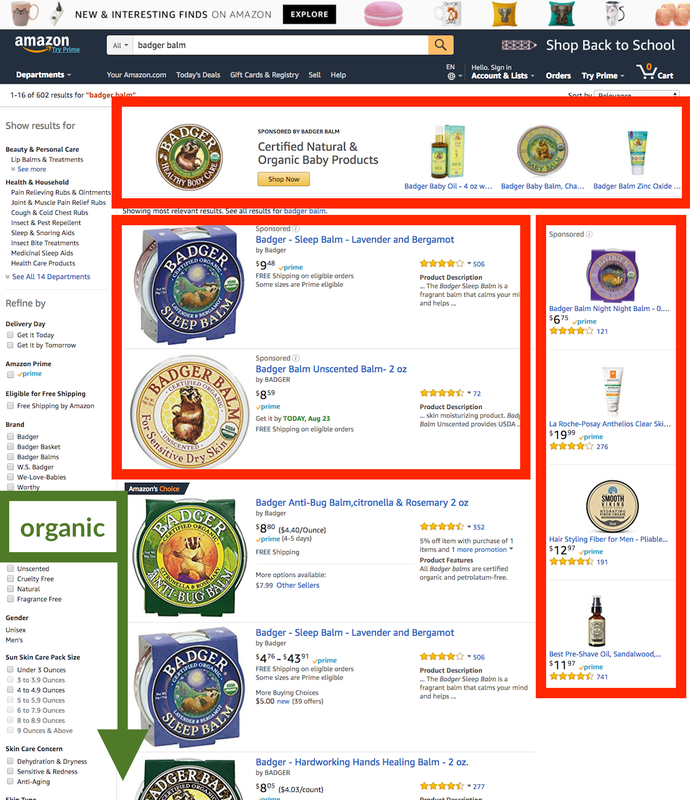 While Seller Central’s Sponsored Product Ads appear at the top of the search results, Vendor Central’s Sponsored product ads appear at the bottom of organic product listings. With Vendor Central, you also have Headline Search Ads. For a while, Headline Search Ads were only native to Vendor Central, but have recently been introduced to the Seller Central wilderness. Headline Search Ads are similar to those you control in Seller Central and now have increased competition from third-party sellers. Like I said at the beginning of this section, you’ll have AMS to back you up if you’re not feeling comfortable doing it on your own. Moving on to Product Display Ads. These types of ads are only native to Vendor Central and aren’t targeted with keywords. I mentioned in my last post that Headline Search Ads and Sponsored Product Ads were optimized by keyword bidding. With Product Display Ads, you select where you want your products to appear. Product Display Ads, like the one in the bottom right corner of the image, aren’t targeted with keywords. Instead, you choose the product pages you want your ad to appear by selecting relevant products. Yes, I eat mushrooms and yes, I’m from Austin. So naturally, I love mushroom coffee. There you have it, all the information on the types of ads in Vendor Central. Now combine what you learned with my last post. No really, I’m tired of saying it. Go look at my last post if you haven’t by now. To be clear, Ad Badger doesn’t help first-party sellers in Vendor Central—at least not yet. But that doesn’t mean you can’t refer to The Badger Burrow for all the information you need about being a first-party seller.